mixed media 74.8 x 88.98 inches 190 x 226 cm LM25885 © Gilbert & George. Ever since they met in 1967 at St. Martins, London while studying sculpture, Gilbert & George has injected life into art and art into life. Even in their recent 2-D works, the pair appears as if a pair sculpture standing still with fixed gaze and stiff posture. These two well-suited gentlemen have used their elegant sartorial fashion to set a contrast between what is represented and what is perceived. Some may say they have pushed the boundary between the sacred and the profane. However, this is not entirely the point, it is by recognizing the rift between the visual symbol and the signified in Gilbert & George's images that one can begin to understand. 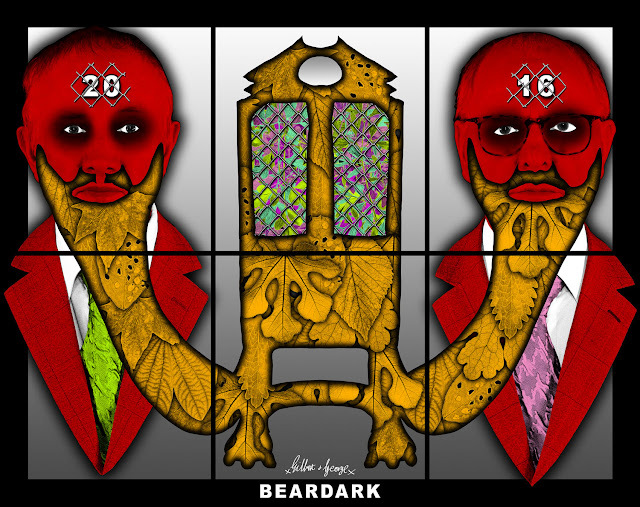 On view now until December 22, Lehmann Maupin presents "Gilbert & George: THE BEARD PICTURES," a seres of mixed media 2-D works. 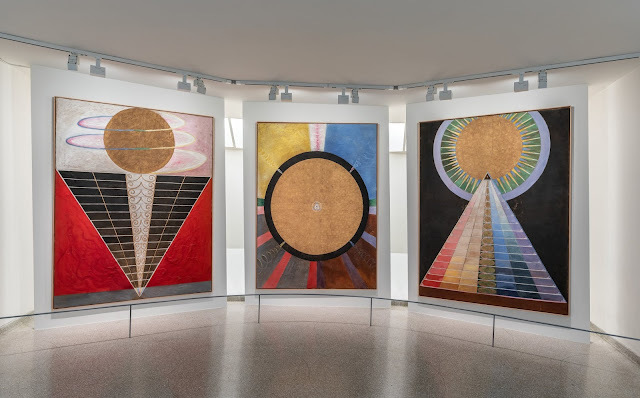 The exhibition is accompanied by a catalogue that includes a wonderful essay by Michael Bracewell, photos of the pair's design layout for the gallery's current exhibition, and of course, all the image reproductions of the works in the show. mixed media 148.43 x 199.21 inches 377 x 506 cm LM25910 © Gilbert & George. 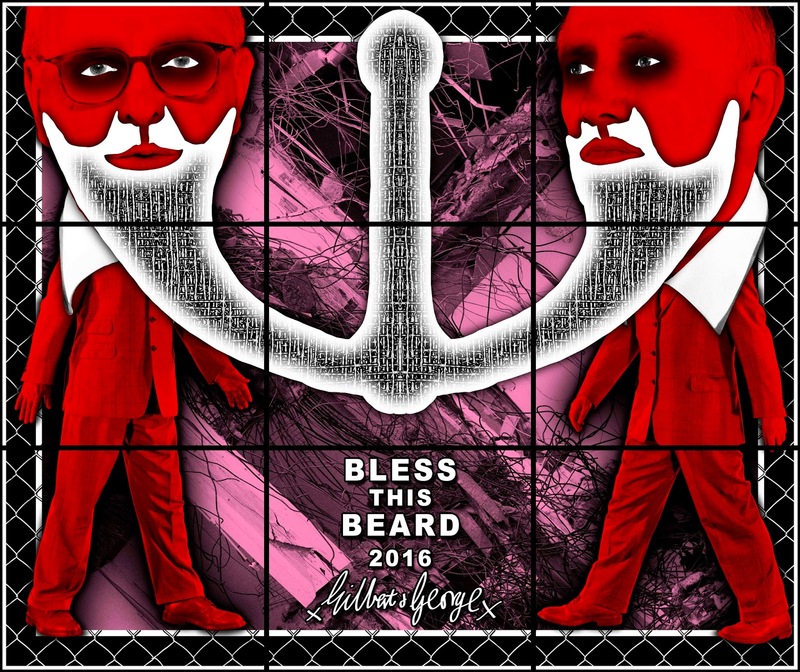 The reference to religious symbol in the "Beard" series is easy to pick-up, however, rather than pure cynicism toward Christianity, Gilbert & George separates the symbolic meaning from the omnipotent sign. 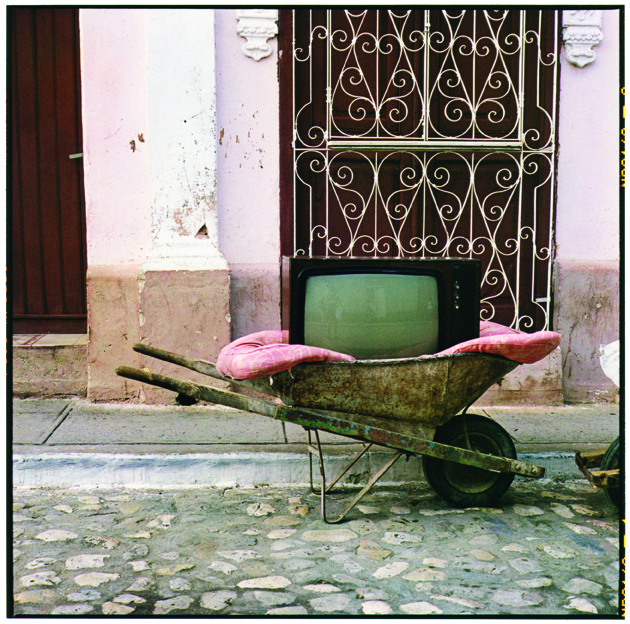 Playing with the semiotic in visual imageries, these works indicate the arbitrary relationship between image and translation. 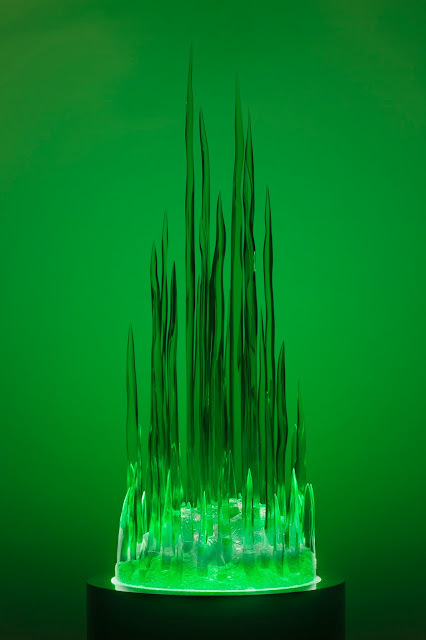 Accompanying each work is a title like gestures of jest and cheekiness. In "Beard Stand," the two look to be sporting barbed wire headgears that some may read as a representation of the thorny twig that Christ worn on his way to be crucified. Within the dark outline of their beards, the appearance of fig leaves may remind one of the similar kind worn by Adam and Eve after ingesting the forbidden fruit. This idea of Gilbert & George mocking religion and showcasing the profane is purely subjective. In "An Essay on the Limits of Religious Thought Written to Prove That We Can Reason upon the Nature of God," Charles S. Peirce writes: "What can we discuss? Can we discuss what we do not comprehend? ... We can discuss whatever we can syllogize upon. We can syllogize upon whatever we can define. And strange as it is we can give intelligible comprehensible definitions of many things which can never be themselves comprehended. "* In this regards, the idea of profanity is as much in the spectator's mind as it is embedded in the signs. 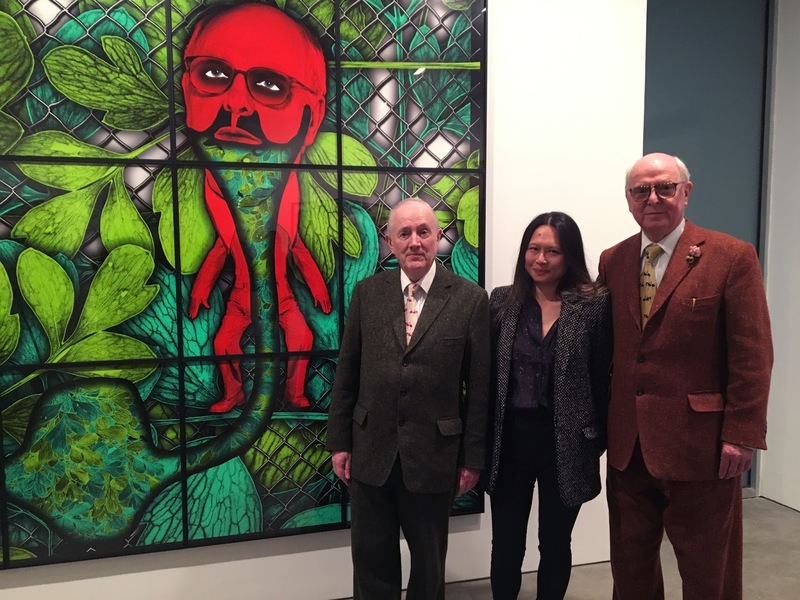 Further more, with the use of colors such as bright red and green commonly seen in classical Medieval paintings depicting religious scenes and subjects, Gilbert & George's work makes it hard to avoid such interpretations. Yet, and more importantly, it is what the image says to the spectator, that, it is man who created god. If anyone should object, with formalism and visual strategy, the pair asks the spectator to rationalize the irrational, if such should exist. mixed media 59.45 x 74.8 inches 151 x 190 cm © Gilbert & George. 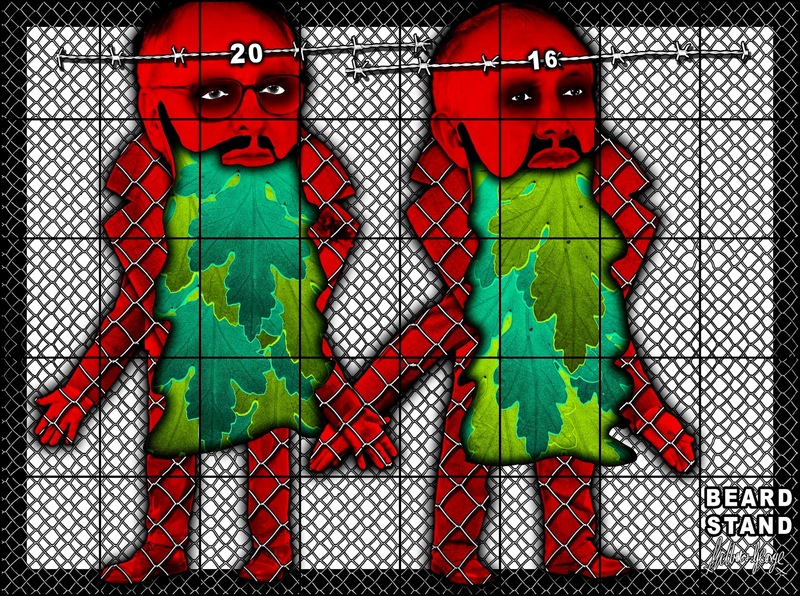 mixed media 88.98 x 149.61 inches 226 x 380 cm LM25897 © Gilbert & George. 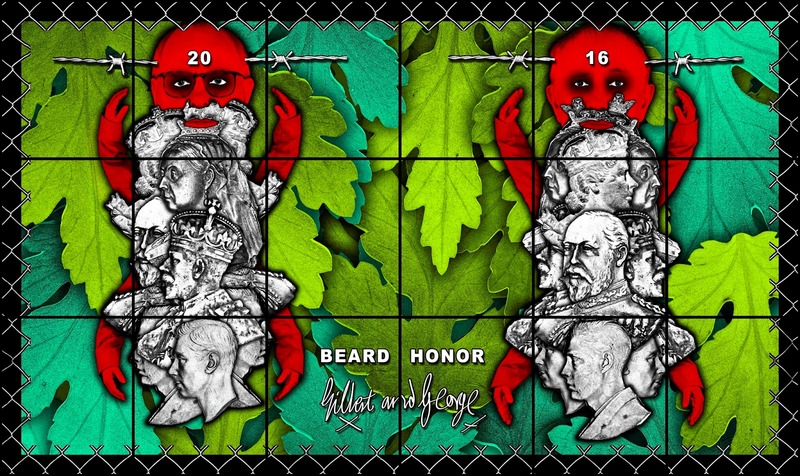 In "Honor," Gilbert & George are covered by emblems of Kings and Queens and royalty, whose profile images are ubiquitous on coins and paper currency. The omnipresence of these figure-heads in modern every-day life elevate and preserve their sense of honor as it were an omnipotent sovereign. Perhaps, here is even a word play between "sovereign" meaning a monarch and "sovereign" as in a name for a one-pound sterling of a British gold coin. Visually, this image presents the pair in a much dwarfed shape, infant-like, each with two pairs of hands, and the rest of the body covered in different shades of gray honorary and commemorative heads. Together, there is an underlying theme about birth, death and re-birth. 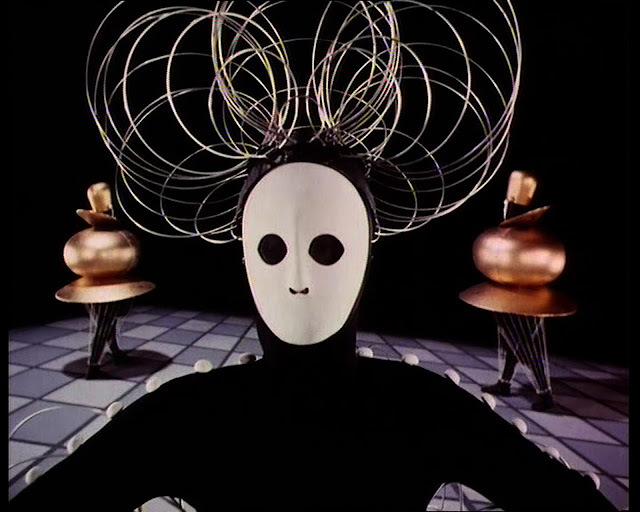 It points to the continuity of the past and the present, and the invention of tradition as a modern construct. On the opening night, I had the lucky change of meeting the two. They were happy to oblige when I asked for a photo. As we all looked happily at the camera, at least I was, but for reasons unfathomable to me, Gilbert & George managed to keep the same expression just as in most of their photos no matter how the surrounding changed from time to time. Don't believe me? Click here. As for my semiotic analysis, and of religion, royalty and tradition, I didn't bring it up. Who would want to spoil the fun? *Charles Sanders Peirce, "An Essay on the Limits of Religious Thought Written to Prove That We Can Reason Upon the Nature of God," Peirce on Signs: Writings on Semiotic by Charles Sanders Peirce, ed. James Hoopes (North Carolina: The University of North Carolina Press, 1991), 14.